SMIDGE OF THIS: Will You Shop For Me? Okay, I admit it: I don't like furniture shopping as much as I thought I would. 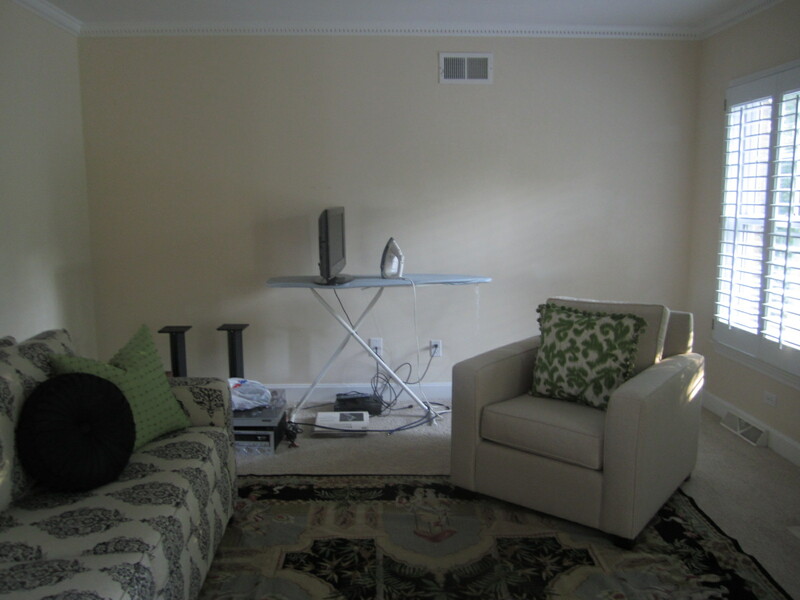 When we first moved into our home, I was so eager to start furnishing the home. And then I froze. Froze out of fear -- fear of making the wrong choices, fear of paying too much or too little, fear of getting the decor totally wrong. Fear of it looking like a college apartment or a grandmother's house. It stayed empty for a while because we waited 6 weeks to get in the West Elm furniture we ordered. 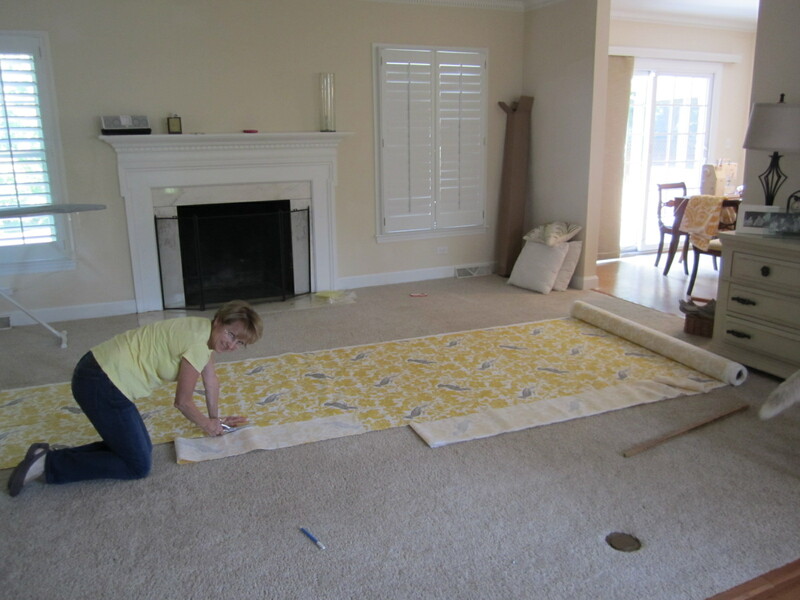 But that came in handy, you'll remember, when my mom and I made the table runners for my wedding. Our furniture has now arrived, and I think I've selected the rug that we'll be using (it's a really cool Oriental rug with an Indian motif ... men in turbans, elephants -- amazing). I've pulled some of the greens out of the rug and selected accent pillows to match. But now, I have a large wall to fill, and selecting a piece of furniture gives me a pit in my stomach. We want this wall to house a TV (possibly mounted although it wouldn't necessarily be our first choice - we'd like it concealed). Our vintage turntable will sit atop it and records, a cable box, and a receiver will all be housed in the cabinets. Speakers will sit on either side of it. What are we using right now? Oh, that. Just an ironing board (which I still am using to do some occasional ironing). There is an identical armchair flanking the other side of the fireplace that is not visible in this picture, and it has the same throw pillow on it. 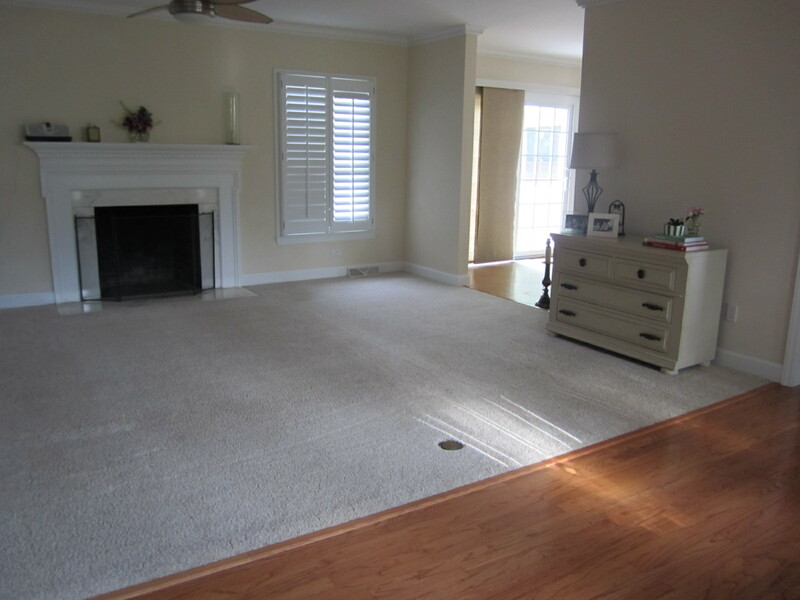 ﻿The rug is obviously not close to being what we have, but it's the best tonal match I was able to find. And our walls are not, I repeat, ARE NOT, sponge painted. We have carpet and not hardwood floors (for now) and I'm not even sold on having a green vase flanking each side of the media center, but it's an option. I also need a coffee table and probably drapes. Oh gosh, I think I'm going to lose sleep over this tonight. Will you help me? Can I bribe you? Send me a link to anything you find online that may suit our room well, and if it's the perfect one for us, you're totally getting a $20 credit to my Etsy store. 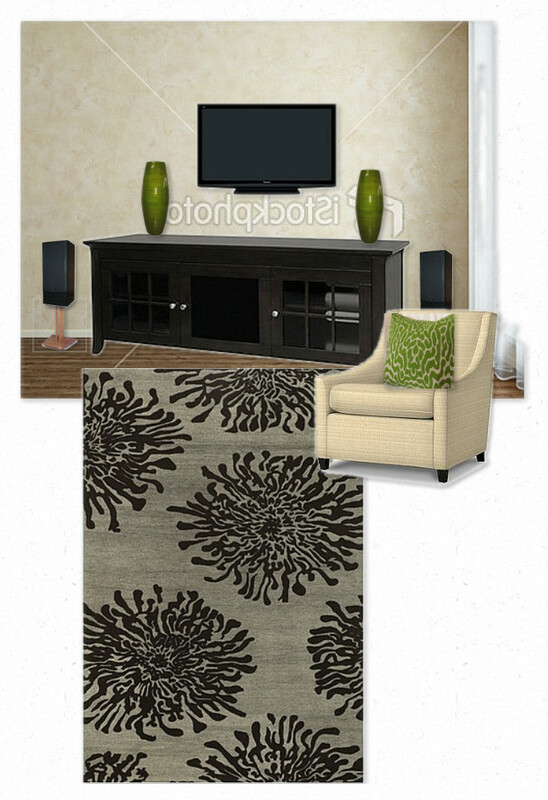 So again - specifications - black, something that will have storage space, not insanely expensive but not a cheapie either, and something that fits the style of the room. And all of you with interior decorating talent - you can be as brutally honest as you'd like. You are not going to hurt my feelings, so if I've already done something that looks bad, don't hold back! If you want to email me directly, my email address is april@alizdesigns.com. When I buy furniture from Target or Walmart (as long as it doesn't look cheap) I just think I'll keep this until it collapses and then I'll probably be at the point in my life to get my interior decorator to just go shopping for me! :-) ANOTHER thing that we LOVE to look at is used furniture. (do y'all have craig's list?) I have a friend who found an INCREDIBLE dining room table normally almost 15000 dollars for something like 9000. AND we got our whole entire bedroom set for next to NOTHING and it is forever furniture and is BEAUTIFUL! :-) Happy SHOPPING! I'll poke around the internet a little bit this afternoon on a hunt for what you want :) Hopefully between all of us bloggers we can find you something good! I love your furniture, April! I'm no expert either. I need help in our house now! When I had my own place I had my interior design friend help me. i've had SUCH issues with West Elm - i don't think i'd ever buy furniture again from them! - i'll totally send u over some links that i think would work! I think you are off to a great start!!! You are off to a great start, I love the fabric of your couch, and the way the table looks up against it. 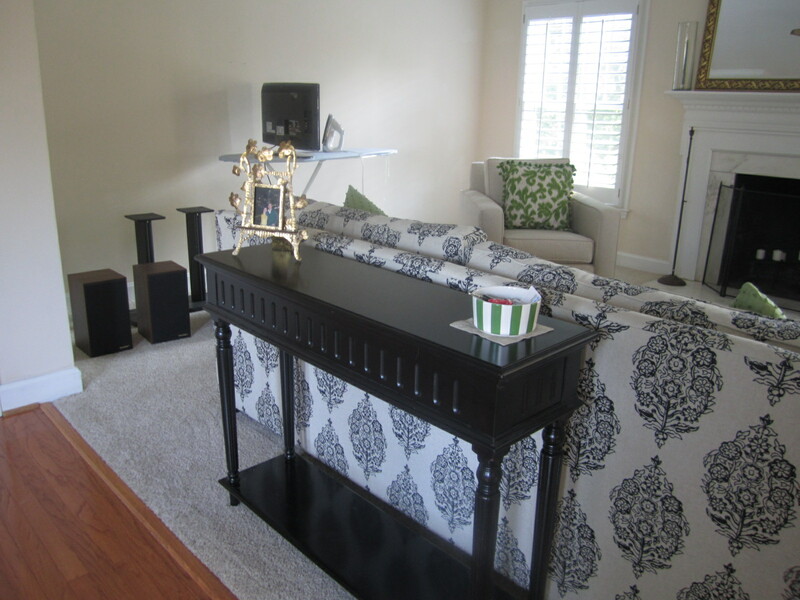 It's so much nicer to see that table when you first walk into a home versus a back of a couch. I'm the last person in the world to offer any advice on decorating since I can't make a decision to save my life. You're off to a great start, though...I'm loving the couch pattern! Giveaway Winner + Friends + Being Naughty? We Welcome Vineyard Vines to Charlotte!